Dolphins are creatures that capture our imaginations and our hearts. These friendly and intelligent marine mammals also seem to be fond of us - not just the trained dolphins at Sea World - but in the wild as well. Somehow we connect with them. 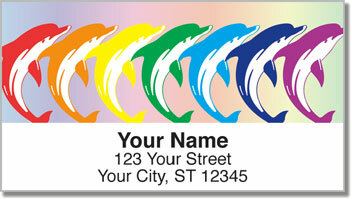 The vibrant hues used to create these original address labels celebrate our fascination with such beautiful animals. Every color of the rainbow is represented in the eye-catching illustrations featured on this design. 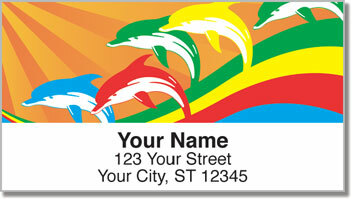 Dolphins love to play - and so do you! 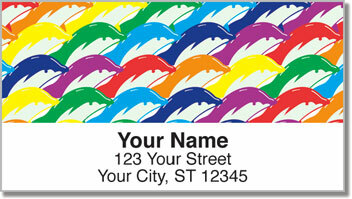 When you choose self-adhesive labels like this, you'll make the tedious task of preparing outgoing mail quick and easy. That leaves more time for fun! 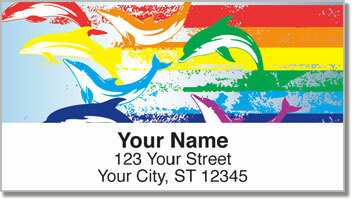 Get your own Rainbow Dolphin Address Labels right now! Order them with matching personal checks.